BRIGHTON, Mich.- Some unexpected Ford vehicle news has made headlines after a member of the Blue Oval Forums discovered an unfamiliar image! In a Powerpoint presentation by Ford Motor Company for the Deutsche Bank Global Auto Industry Conference, an image of what looks to be a next generation Ford Edge has been either accidentally or purposely included in the presentation. Although the presentation occurred last month, the Leaked 2015 Ford Edge Image was not discovered until this week! It's hard to see much since the image of the suspected 2015 Ford Edge is very small, but we can distinguish the significant changes to the vehicle's front and body style. 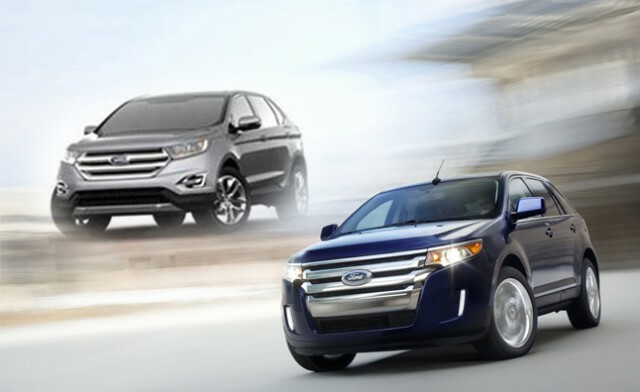 The headlight shape appears to remain similar to the current 2013 Edge, but we see influence from the 2013 Ford Fusion in the fog light bezels and grille. We don't know if the image was placed in the presentation on purpose or on accident but the Leaked 2015 Ford Edge Image reveals that the crossover looks to be completely redesigned! For full features and specifications on the current Edge, take a look into the 2013 Ford Edge Brochure and if you want to make it yours remember that we have Ford Edge Rebates to save you money! Your Brighton Area Ford Dealer is located at 8240 Grand River Ave. just north of I-96 in Brighton. We are a family owned and operated business that strives on customer satisfaction. For more information on Brighton Ford visit BrightonFord.com or give us a call at (800)-836-8206.